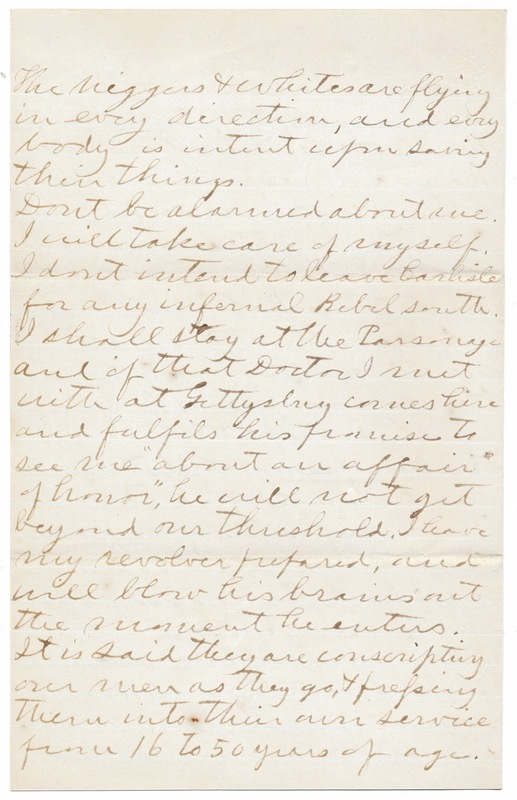 "...it may be that the Rebels will not be so harsh as apprehended." Couldn't get the others though. =/ Amazing letters, thank you so much for sharing! Oh, and I think it may read that the prisoners were 'loped' through. "We know of no Union force to oppose them." 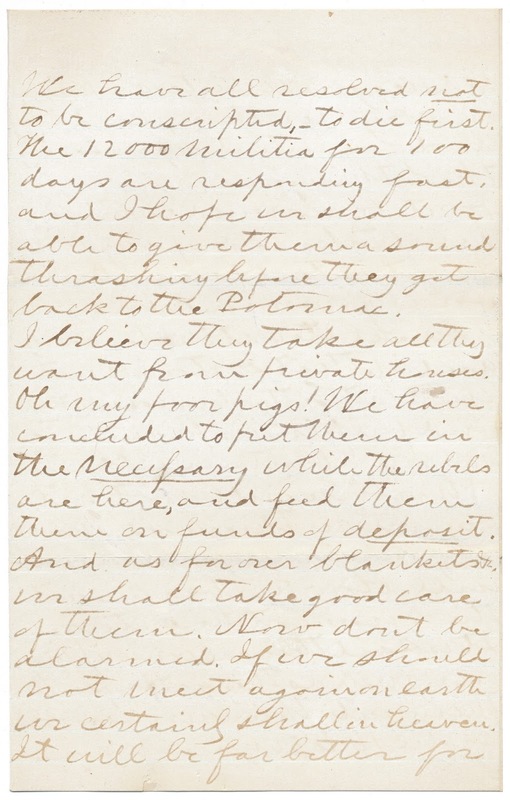 "We have concluded to put [the pigs] in the NECESSARY while the rebels are here, and feed them on funds of deposit." I think it might be 7 thousand, and with 40,000 behind. I can never read these letters without wondering "how it ended". The space in the first paragraph reads: We "know of no" union force to oppose them. Okay, let's look at history for some context. Carlisle is the county seat of Cumberland County, about 30 miles north of the little hamlet called Gettysburg, which in 1863 hosted one of the largest land battles in the Western Hemisphere, and Lee's army was broken but not decisively defeated. 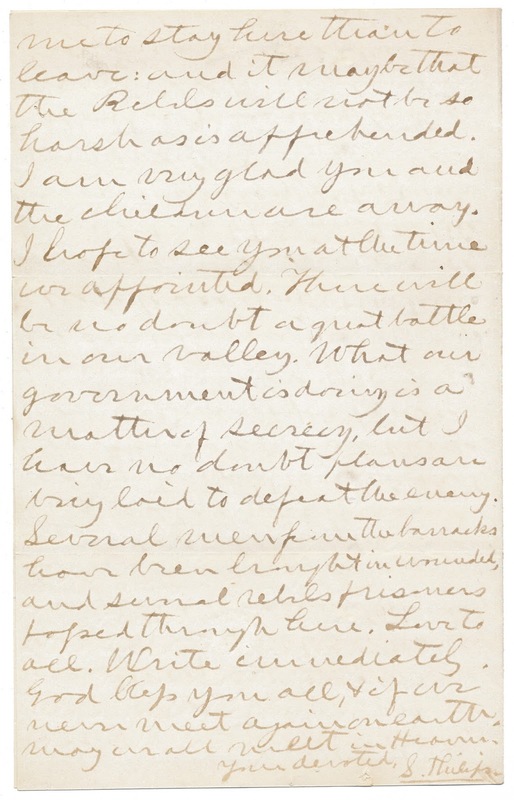 Afterward, the Confederate armies didn't get into major actions north of the Potomac, and Phillips doesn't mention the massive battle at Gettysburg a year before, so in haste he may have misdated the letter, or it could be a fake of some kind. 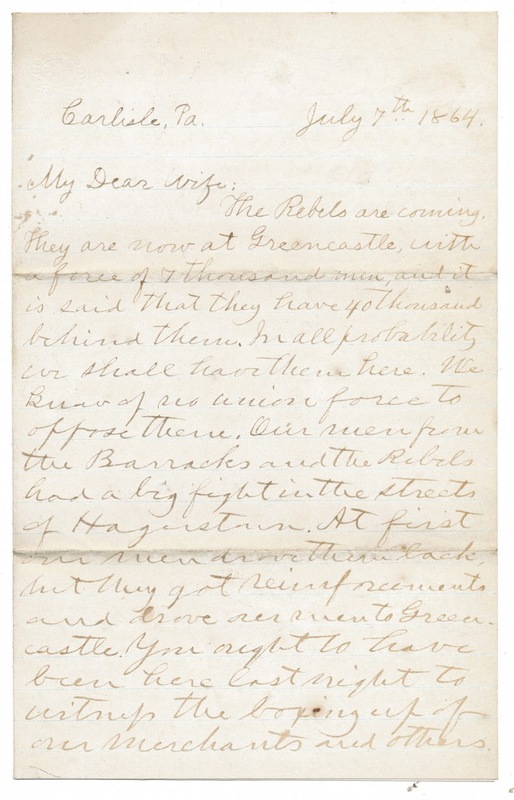 I also call issue to the dating of July 7th - there was a Battle of Carlisle on July 1st, but by the 7th Union forces were pursuing the damaged Confederates southward, and I doubt Carlisle was in any danger by this point. With that, let's look at the Battle of Carlisle. 3 brigades of rebel cavalry under JEB Stuart, were raiding deep into Pennsylvania ahead of Lee's Army, trying to stir things up and create confusion, but the raid on Carlisle delayed Stuart from returning to Lee's Army, forcing Lee to advance cautiously without the reconnaissance functions typically performed by cavalry during the War. Stuart shelled the town of Carlisle (according to Wikipedia, there's still a dent on the front of the county courthouse) and then retreated just after midnight July 2 when he heard that fighting had started near Gettysburg. If this is authentic - and I have my doubts, though the date could be an error of haste - you have a very interesting piece of history here.